Analysis: The 'Rabaa Operations Room' retrial is a thinly veiled attack on the universal values of free speech. Tomorrow, 51 people, including 14 journalists who are guilty only of doing their job, will stand retrial on charges that are punishable by death. Of course, I am speaking about the farce that is the "Rabaa Operations Room" trial in Egypt. 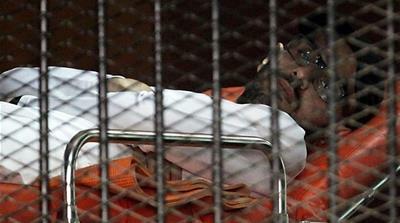 This case is nothing but a deceitful attack on freedom of expression by the Egyptian government. I know this because I am a defendant in this case. Jazeera staff trial, would cause an unaffordable international embarrassment. So, this case was cast as a terrorism trial and labelled with a frightening name: "Rabaa Operations Room", a reference to the 2013 Rabaa al-Adawiya Square anti-government protests that were violently dispersed by Egyptian authorities. To justify the label, former members of Egypt's ousted government were arbitrarily added to the roster of defendants only days before a trial date was set. By attaching the absurd "terrorist" label, the government hoped to escape international scrutiny. It almost did. But in its planning, the government did not account for a formidable resistance to its frail narrative. During my time in prison, in retaliation against the unspeakable conditions and systematic torture that my friends and I were subjected to while we awaited trial, I decided to begin an open-ended hunger strike. Our story, our plight and our stance resonated with people around the world and crowded out the lies being propagated by the government. The case became known internationally and quickly became a pain for the government; I was subsequently released. Since my release, this case has faded from the international consciousness, although the injustice remains as revolting as the day it began. For the last for two-and-a-half years, innocent civilians have languished in underground dungeons with no end in sight to their suffering. Each has a story of hopes and dreams waiting to be fulfilled, of a life waiting to be lived. Abdullah Alfakharany is a doctor-turned-journalist. In his late 20s, his dream of marrying the love of his life and starting a family was put on indefinite hold. Samhy Mostafa, a journalist by profession, is an only child to a single mother. He is also a young father to two beautiful boys, one of whom was born months after his detainment. Mohamed Adly is a young journalist who was forced to put his life on hold and break off his engagement while in prison because of the uncertainty of his future. His mother died without having the chance to say goodbye to her youngest child. Omar Malek is a young and energetic entrepreneur with a promising future, whose only crime was being the son of his father. For the last for two-and-a-half years, innocent civilians have languished in underground dungeons with no end in sight to their suffering. These stories, and many others, are glimpses of precious lives being robbed. Their stories should not fall on deaf ears, and their voices should be heard. Their natural place is out here, with us; they should be sharing their lives with their families and raising their children, not worrying about how best to say goodbye. Fourteen people, including Malek, my father, and a journalist were sentenced to death last year by the notoriously politicised judge, Mohamed Nagy Shehata (aka "The Butcher"). The rest of us were sentenced to life in prison. The retrial tomorrow will likely be just as lengthy as the first, just as politicised, and the outcome will be equally unjust, unless the conscience of the international community is awakened. Like in my case and in the case of the Al Jazeera staff, NGOs, media outlets and governments have a responsibility to demand the immediate release of the journalists and other political prisoners. Anything short of that is a glaring betrayal of the values and principles that our societies are built upon. At the end of the day, this fictional "operations room" is nothing but a disguise for an attack on the universal values of free speech.